Good Bat News of the Week! Baturday News is a weekly blog written by Rachael, a 7th grade student and Save Lucy volunteer. Rachael’s interest in bats was sparked by the big brown bats that used the outside of her former home for a winter roost. Her family cheerfully hosted this wild colony for years. Gulf Branch Nature Center provided a beautiful photo op at Bat Fest Arlington! Hi everyone! I am soooo happy! I read an article about a power company in Middlebury, VT that has some very special guests. Green Mountain Power said that a new little brown bat colony has moved into its hydro facility and they are going to let them stay. The building is more than 100 years old! The Vermont state biologists think that the colony moved in because the building is close to Otter Creek and is nice and warm inside. I bet the little brown bats are all probably really cute and really happy right now. Since WNS first appeared in Vermont, the little brown bat population has decreased by 90% so I am very glad that Green Mountain Power is letting the colony stay. I am also happy because little Freda the Brazilian Free Tailed bat is doing well, and so are all the other bats that Save Lucy is caring for. They still haven’t found Freda’s colony, but she’s growing well and seems happy with her new human friends. 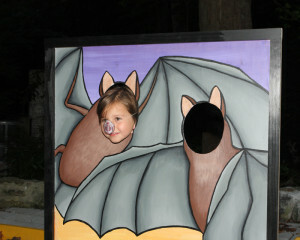 Bat Fest Arlington was a success last week. There is a cute picture on the Save Lucy Facebook page that shows the hungry big browns and reds waiting for their dinner after Bat Fest. Apparently the poor little critters had to eat a little later than usual.